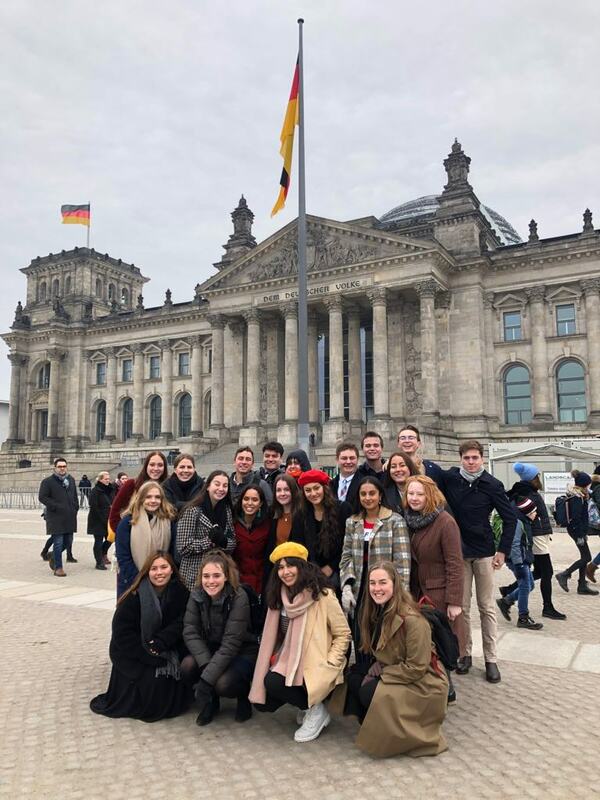 After a late-night arrival, the Delegation woke up eager and excited to explore the kookiest city on our itinerary: Berlin. With an appealing mix of old and new, walls painted with graffiti, and dozens upon dozens of vegan cafes, Berlin felt like the cool new kid on the block. 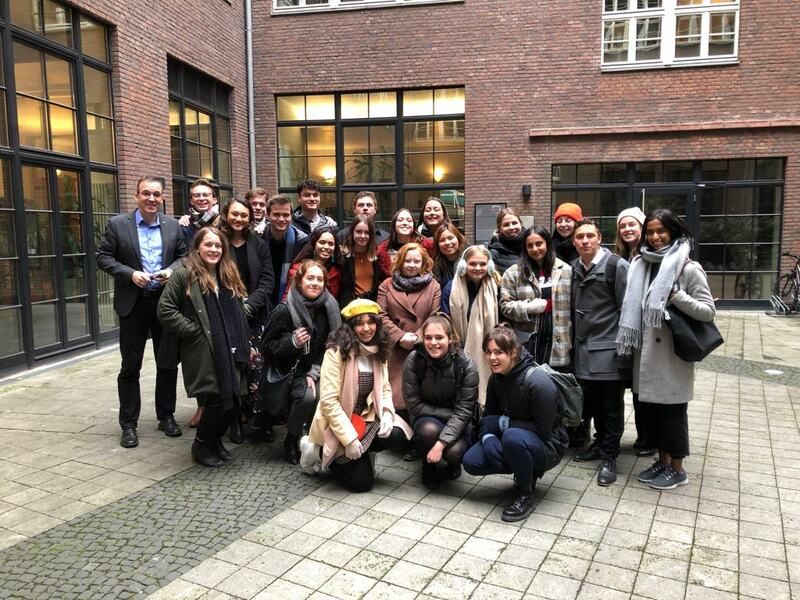 We traipsed our way through the newly-designed Potsdamer Platz (once the world’s largest building construction site, after the wreckage caused by World War II), before arriving at our first meeting with the prestigious German Council for Sustainable Development. Members of the Council are elected by the Chancellor of Germany, Angela Merkel, to advise the government on its sustainable development policy. It also has a further task of creating and sustaining public dialogue around sustainability issues, whether they concern the environment or in more niche industries like finance. Dr. Veronica Tomei, with whom we met, started the presentation by outlining the Council’s projects, before turning the discussion on the sorts of sustainability initiatives that take place in New Zealand. Needless to say, it was an incredibly engaging meeting! Once the meeting finished, the Delegation caught the S-Bahn to the East Side Gallery. 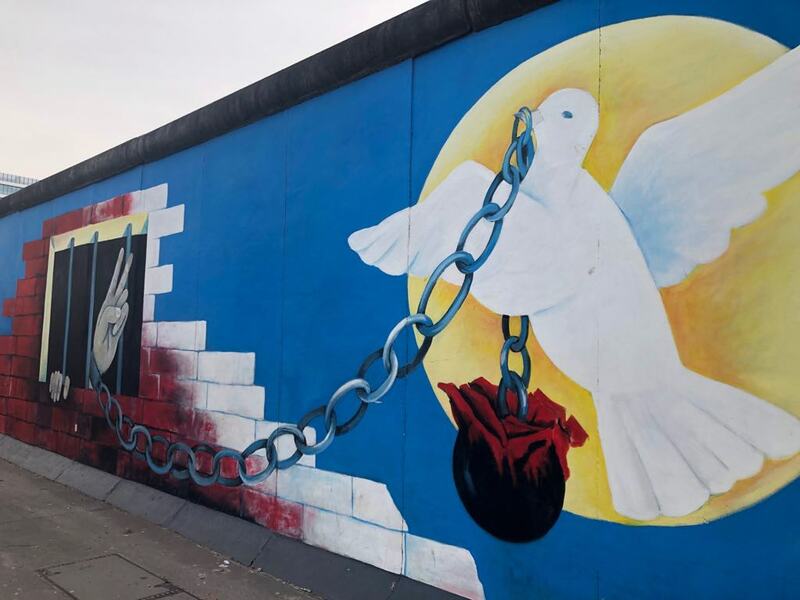 There was an amazing array of murals on the remnants of the Berlin Wall, from quirky expressions of abstract art, to more serious and somber visuals on the importance of human rights. After the Delegates (and Director(s)) were satisfied with their potential Instagram shots, we mentally resolved to trek all the way to Alexanderplatz – an open square in Central Berlin, directly beneath the TV Tower – before ending the evening at a traditional German pub (apologies to our vegetarian delegates!). The next morning was considerably more sedated, given our pitstop at Sachsenhausen – a former Nazi concentration camp, used primarily to imprison prisoners-of-war during World War II. While it was incredibly harrowing to walk the footsteps of those before us, and to witness the atrocities that had been committed on those grounds, it was also an empowering reminder to not let history repeat itself. While the train ride back to Central Berlin was a quiet one, our mood did perk up during the afternoon’s Walking Tour. 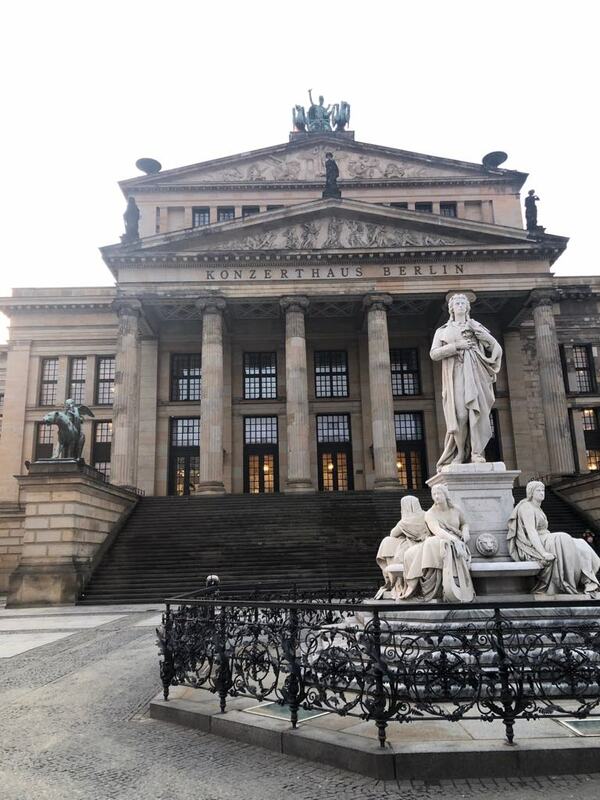 We explored the history behind the Brandenburg Gate, learnt that the Memorial to the Murdered Jews of Europe has no official meaning (leaving it open to interpretation), and walked over an unassuming parking lot – which turned out to be (spoiler alert) Hitler’s Bunker. A massive shout-out to our lovely Tour Guide, India! Our visit to Berlin was quickly coming to a close, much to the dislike of both Delegates and Directors. Friday morning began with a Tour of the Reichstag, the historic meeting place of the Bundestag (the German Parliament). 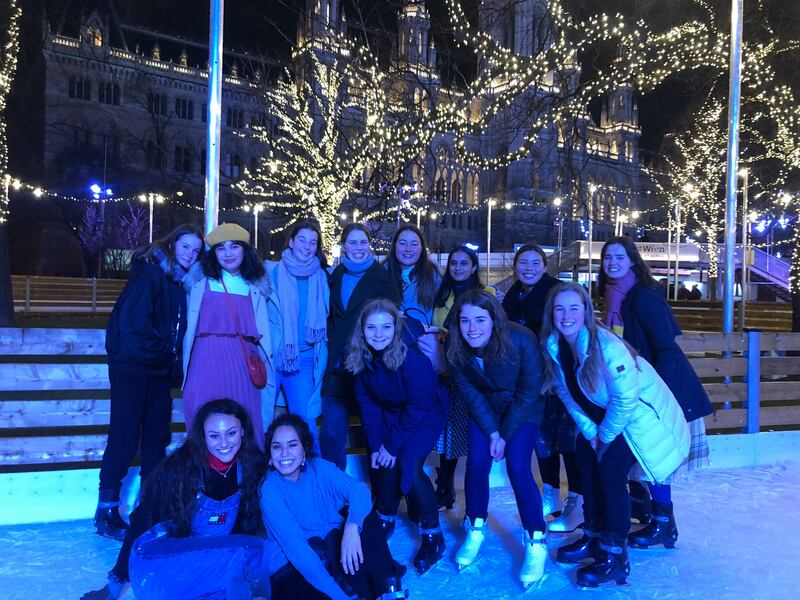 A fun fact that we learnt was that the newly-constructed glass dome at the top of the Reichstag was meant to symbolise the transparency of the German government! We then hiked our way to Checkpoint Charlie for our last meeting in the city, with the United Nations High Commissioner for Refugees. Chris Melzer, the Spokesperson for the Organisation, was incredibly engaging and passionate about the work that he did. The Delegates thoroughly enjoyed discussing the contentious issues of the refugee crisis, including the threat of human trafficking and the assimilation of refugees into Western society. Chris also talked about his experience as a teenager growing up in the Cold War environment. He lived in East Berlin and witnessed the ideological fall of the Berlin Wall in 1989 – a heartening reminder to both Delegates and Directors of the freedoms we have today! The day ended early, given our early morning flight to Vienna (hello, 3am!). 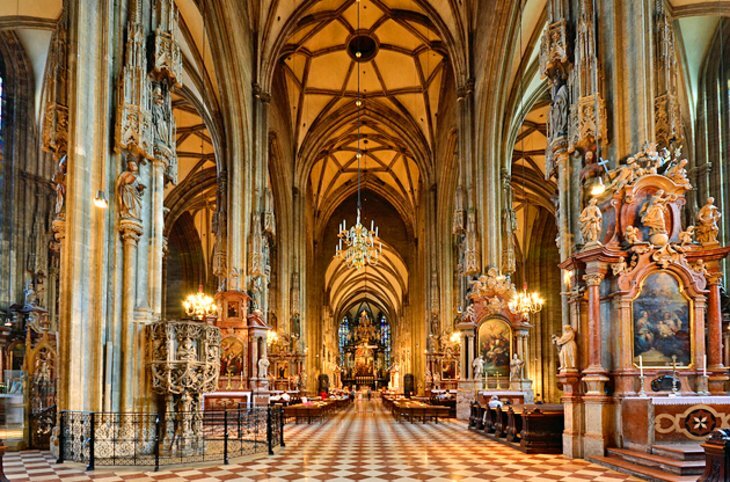 Catch us in Mozart’s city next! Posted in Global Development Tour, Global Development Tour 2019Leave a Comment on BRRRRR-LIN! Saturday morning in Paris kicked off with a walking tour throughout the city. 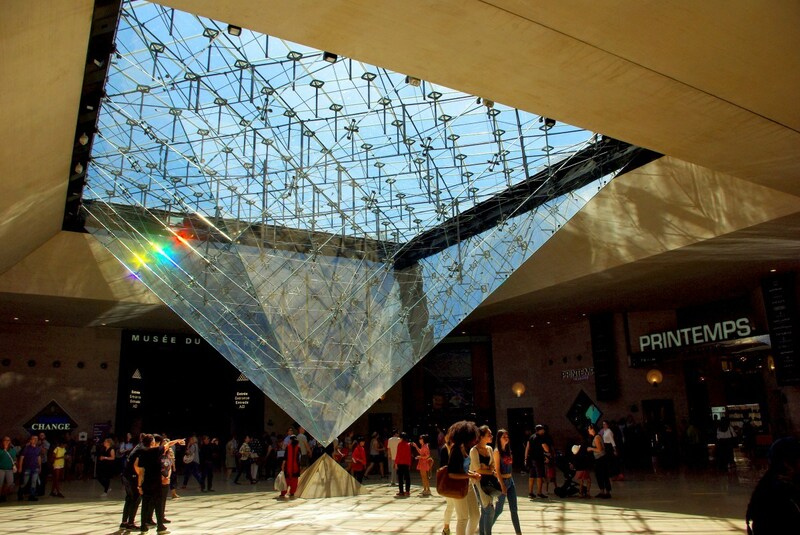 We started at Notre Dame, weaved our way through one of the first – and most narrow – streets in Paris before Hausmann’s ‘renovation’, and ended at the Louvre. One fun fact we learnt was that Notre Dame was a building that Parisians initially hated and thought was an eyesore – before a man named Victor Hugo came along and wrote a novel called The Hunchback of Notre Dame in order to save it from being destroyed – ever heard of it? Another fun fact was that if we’d spent 30 seconds looking at every single piece of art in the Louvre, it would take 100 days with no breaks! The Delegates thoroughly enjoyed viewing several pieces of famous art: the Mona Lisa, the Winged Victory, and Liberty Leading the People, to name a few. The next day was our one and only Director’s birthday! The ‘surprise’ in the morning consisted of numerous chocolates, a couple of cards, and even unravelled the poetic prowess of a couple of the Delegates. 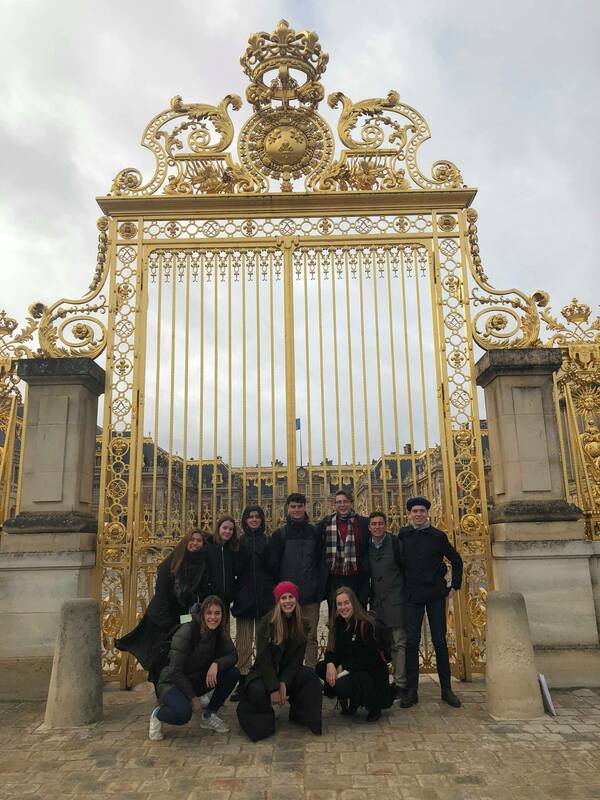 The Delegation then split into two: one group went to explore Montmartre and Sacre Coeur, while the other group trekked out to see Versailles Palace. We regrouped in the evening to fittingly end Mitchell’s birthday with a delicious French chocolate gateau. The Sustainable Development Goal attributed to the City of Light was Goal 8: Decent Work and Economic Growth, so it made sense that we meet with the United Nations Educational, Scientific, and Cultural Organisation (UNESCO). 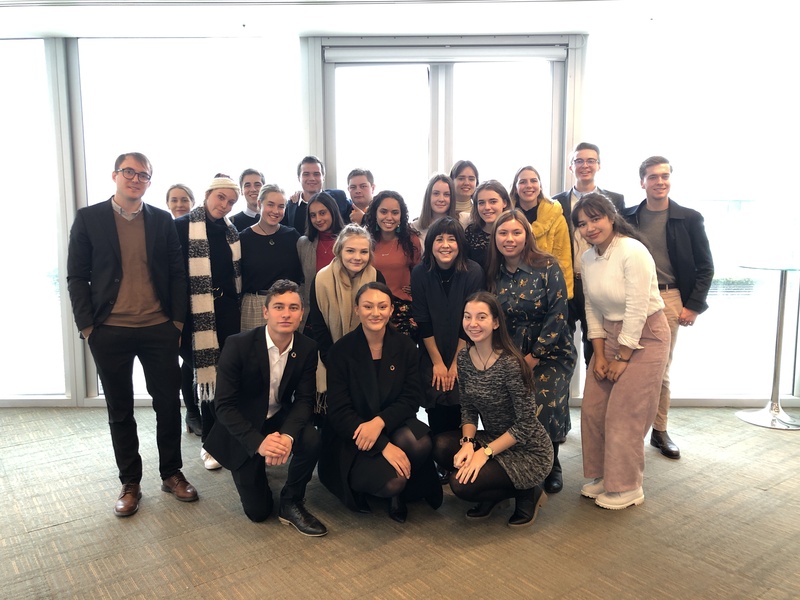 On Monday morning, we were introduced to Tim Francis, a New Zealander working at UNESCO, and Julie Saito, an Emmy-award winning journalist who is now a Specialiste of Communication. Tim discussed how the majority of UNESCO’s work was actually in the ‘Educational’ sector of their title, while Julie invited the Delegates into a discussion around the best ways the SDGs could be engaged with by youth. The Delegates thoroughly enjoyed the meeting, which ended with a tour of UNESCO’s building. 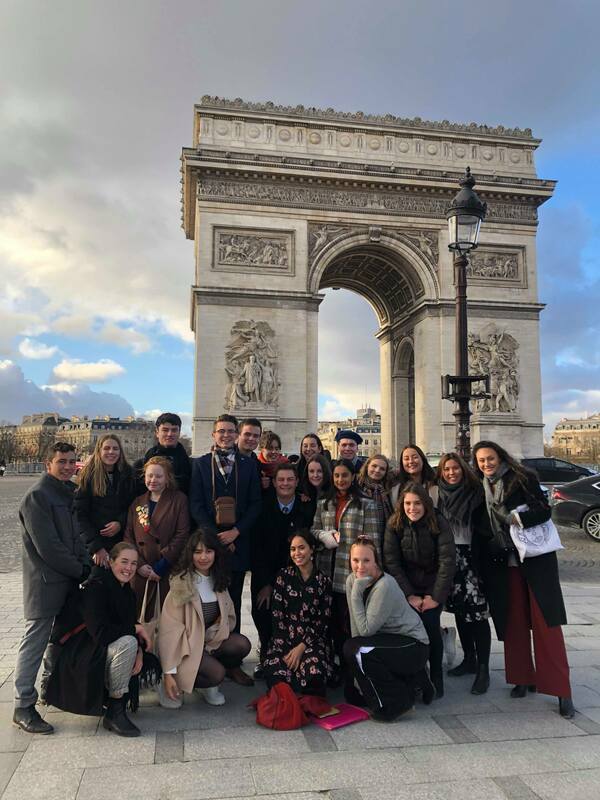 That afternoon, the Delegation did a bit more sightseeing, with pit stops at the Eiffel Tower and the Arc de Triomphe. We ended with a leisurely stroll through Champs-Elysees, where many Euros were dropped on Laduree macarons (although no one can quite bring themselves to regret it). The next day was sadly our last in Paris. 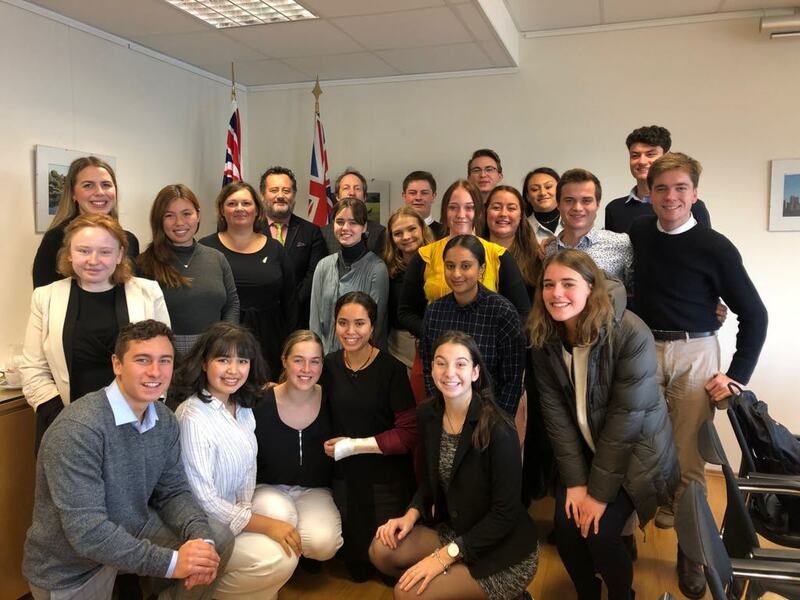 We had an incredible meeting with the New Zealand Embassy and Permanent Representative to the Organisation for Economic Cooperation and Development (OECD). We met with a dynamic duo of Roger Dungan, a scientist-turned-diplomat and Ginny Chapman, a diplomat with a career history based primarily in the former NZ Aid programme in the Pacific. The Delegates asked a series of questions relating to New Zealand’s involvement with the OECD before the meeting ended with a networking session (supplemented with French pastries, of course!). Next up on our itinerary: Berlin! 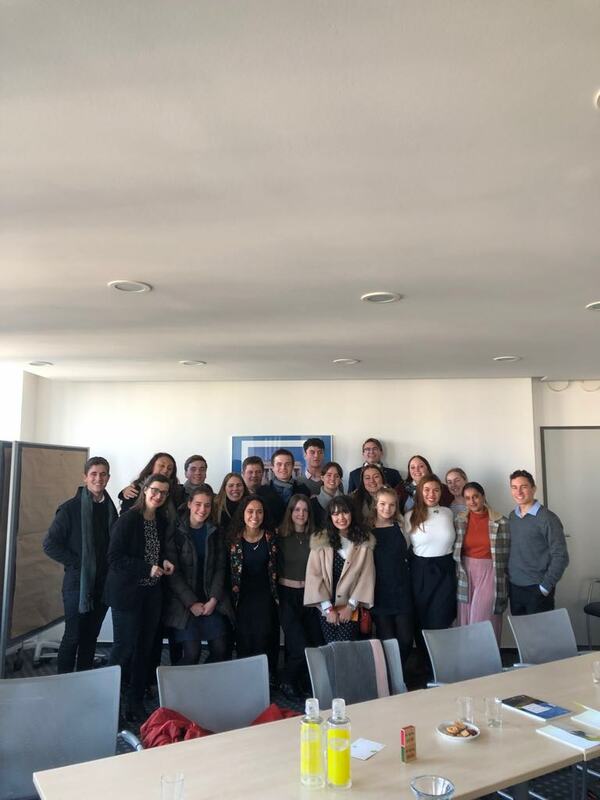 Our adventures in London continued on Wednesday morning with a visit to the United Nations Global Compact, held at their seriously cool office space in an Islington art gallery. There, the Delegation learnt all about the work the Compact is doing educating the public and the private sector on the SDGs. The highlight of the meeting was undoubtedly the interactive component, where the Delegation were divided into groups, each of whom were allocated an industry, (eg, financial services, retail, oil and gas), and a level of engagement with the SDGs (eg, advocates for the goals, indifferent towards them, or interested in knowing more about them). The teams were then tasked with responding to a range of scenarios from the perspective of their specific stakeholder. Following this, the Delegation tubed across town for our second meeting of the day with the New Zealand High Commission, at the beautiful New Zealand House near Trafalgar Square. The Delegation enjoyed hearing from the Deputy High Commissioner and the team, who were all riding a high, fresh off a successful visit from the Prime Minister. Other topics of discussion included Brexit, the Commonwealth, and the continued importance of the New Zealand-United Kingdom bilateral relationship. 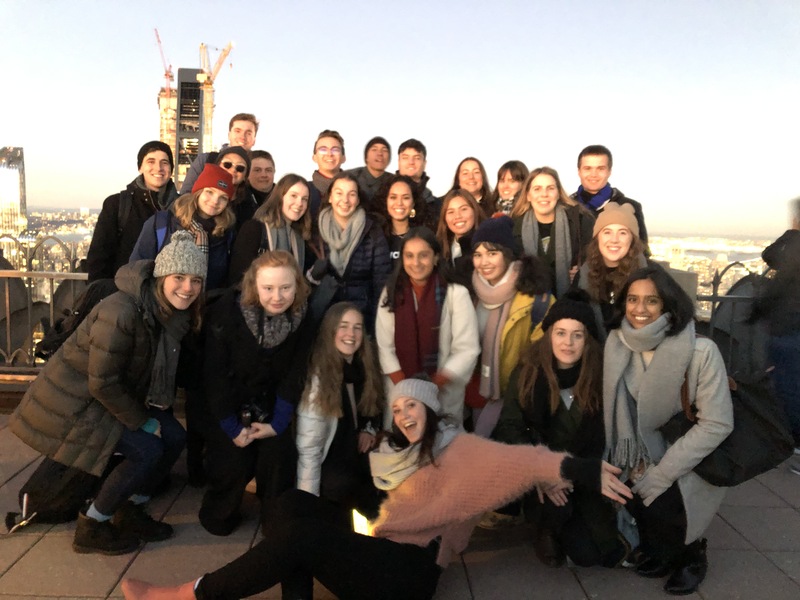 Following the meeting, the Delegation were fortunate enough to get to check out the breathtaking view over London from the roof of the House – the perfect spot for yet another Instagram or profile picture update (as if we haven’t had enough of those already!). Our final full day in London kicked off on a high, with the Delegation’s meeting with Advocates for International Development (A4ID). 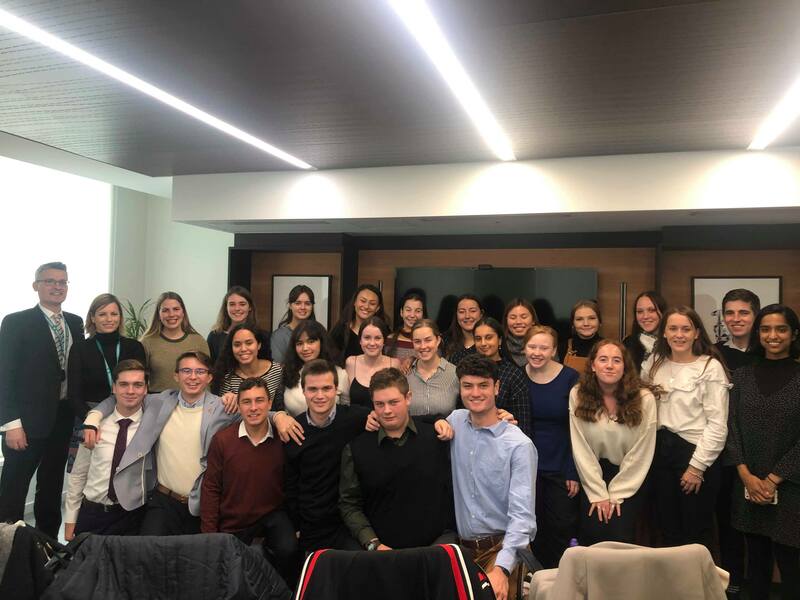 A4ID secured the Thames-side offices of Magic Circle law firm, Norton Rose Fulbright, for this engagement with two members of the team – including a New Zealander from none other than Hamilton! 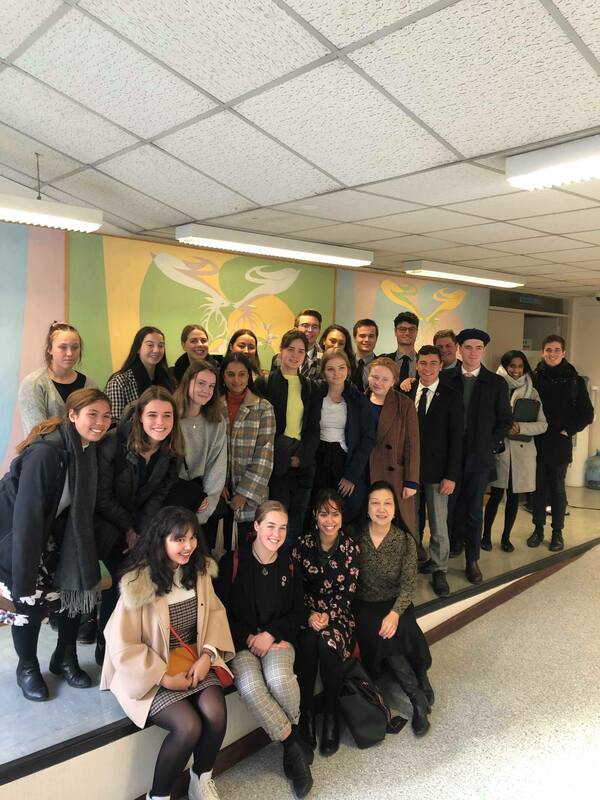 The Delegation loved hearing about the work A4ID does in partnering major legal firms with worthy NGOs operating in the human rights, gender equality, and education fields. From Norton Rose, the Delegation couldn’t pass up an opportunity for a photo op with Tower Bridge, before heading off for a delicious lunch at Borough Market, where sights, smells and free samplers were aplenty! The Delegation then made their way along the Thames to Shakespeare’s Globe Theatre, before exploring the Tate Modern and / or St Paul’s Cathedral. Next on the agenda was our much-anticipated meeting with the Royal Institute of International Affairs, aka: Chatham House, aka: one of the most high-powered think tanks in the world! 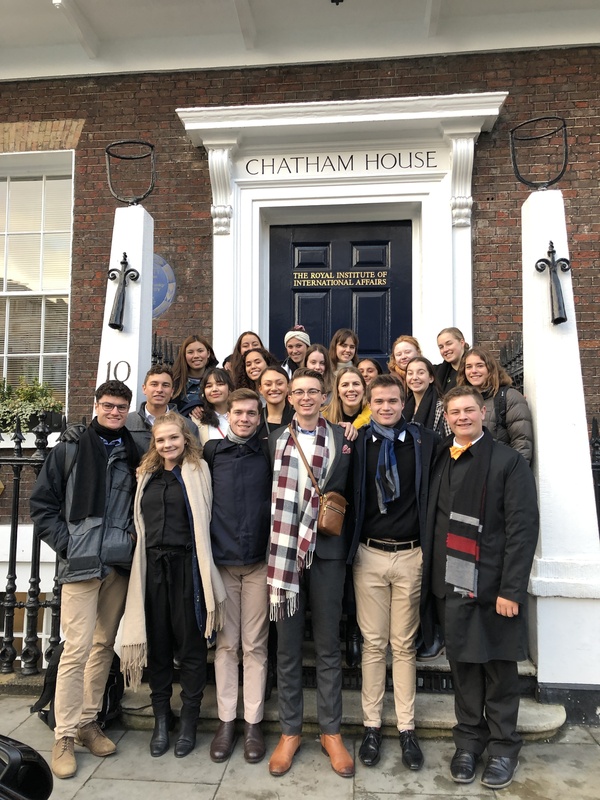 The Delegation received a warm welcome from the Chatham House team, who provided TED Talk-style presentations on a number of the diverse work steams the House is involved in, followed by another interactive activity. Of particular interest to the Delegation was the presentation on the reduction of meat consumption, and hearing the House’s views on the viability of plant-based and lab-cultured meat alternatives, which are purportedly indistinguishable from their genuine counterparts. There was a lot of discussion around the ‘Impossible Burger’ (as featured on Air New Zealand business class), which the Delegation all hope to put to the taste test one day soon. Catch you in Paris next! Ever wondered what it’s like to MUN at midnight? Well, wonder no longer. After a full day of committee sessions on Saturday, four of our Delegates (Caitlin Hancy, Manuevaha Latu, Kate Falloon and Kyle Hannah) were called up to partake in the CMUNCE Midnight Crisis Session, held at the very impressive Marriott Marquis Times Square Hotel. 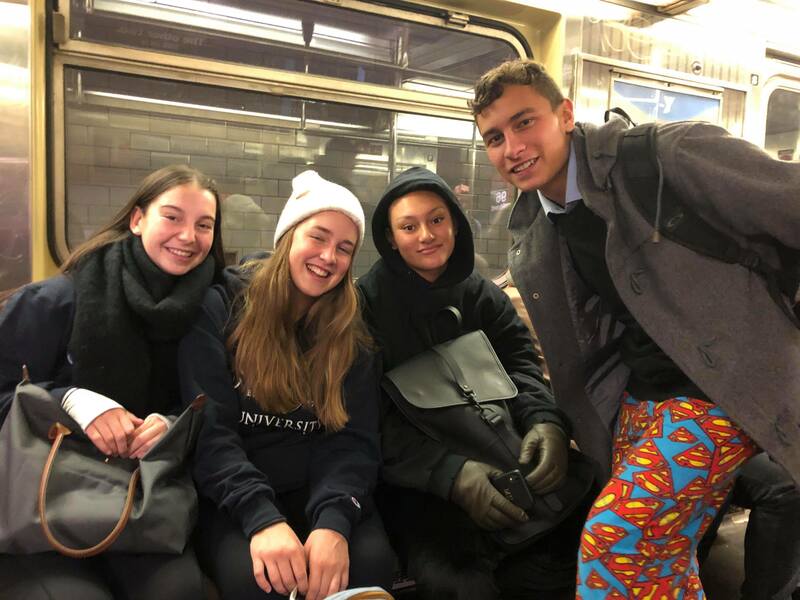 Replete with fat pants and PJs (a somewhat different aesthetic to the other committee sessions), the Delegates, Mitchell and Gauri set off on the train for a two-hour crisis debating session (with a much-needed Starbucks stop on the way). 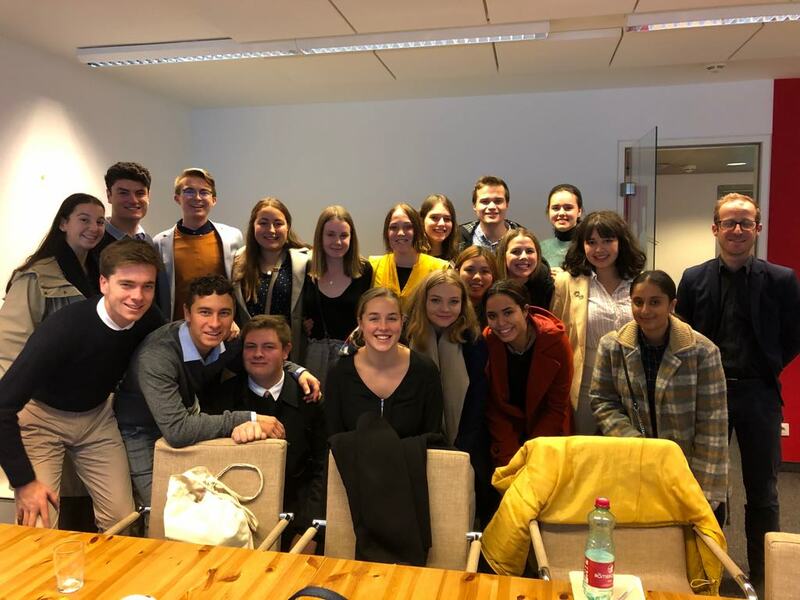 The Delegates all thoroughly enjoyed Midnight Crisis, particularly with having the opportunity to practice for future careers in diplomacy, where issues do not always adhere to a nine-to-five schedule. With the rush that was Midnight Crisis over, the Delegates soon found themselves approaching the last day of CMUNCE! The closing ceremony was an experience-and-a-half, with hundreds of students cloistered into Columbia’s Alfred Lerner Hall to hear the results from the three-day conference. Awards were available for Verbal Commendations, Honourable Mentions, Best Delegate, and Outstanding Delegate. 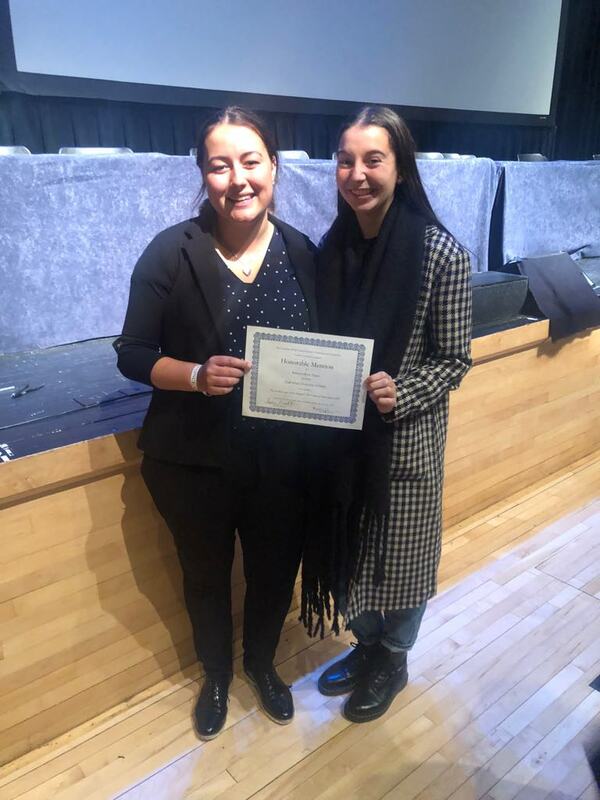 We’re incredibly proud to say that two of our own – Rebecca-Rose Ngatai and Caitlin Hancy – won an Honourable Mention and a Verbal Commendation! Rebecca-Rose was in the Golden Age of the Mughals Committee, while Caitlin was in the Ad Hoc Committee of the Secretary-General. After CMUNCE, the Delegates and the Directorship hustled themselves to John F. Kennedy Airport to catch a seven-hour flight to London. There were many a red bus and telephone booth to see as we drove through town, so our first glimpse of the city did not disappoint! 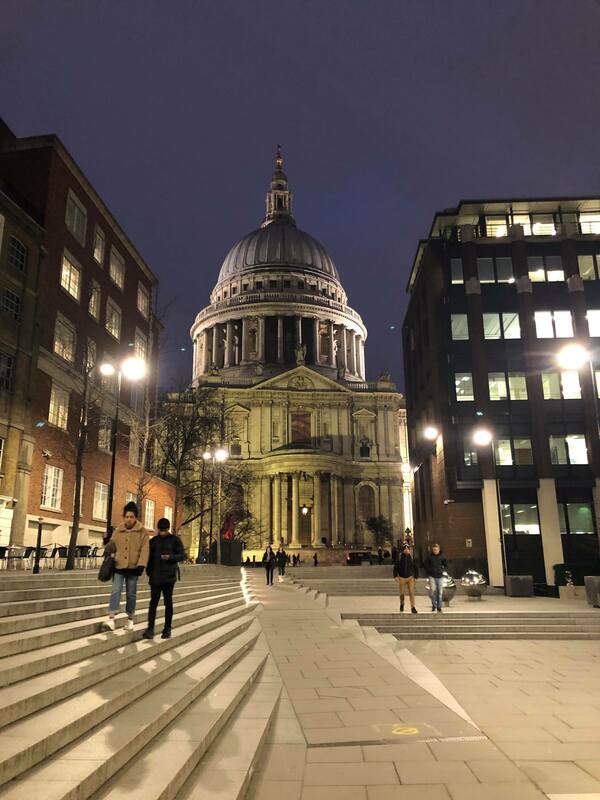 Once we were all well and settled, we went out to see Tower Bridge, The Shard, and St Paul’s, before fittingly ending the evening with a British meal (think fish n chips, bangers and mash, mince pies) at a pub that’s been running since 1660! The next morning, the Delegation went off to get to know London a bit better. Our first stop: Buckingham Palace. After navigating the London Underground (which was considerably more confusing than New York’s grid-like subway system), we arrived at Green Park. Though some Delegates (and Directors!) 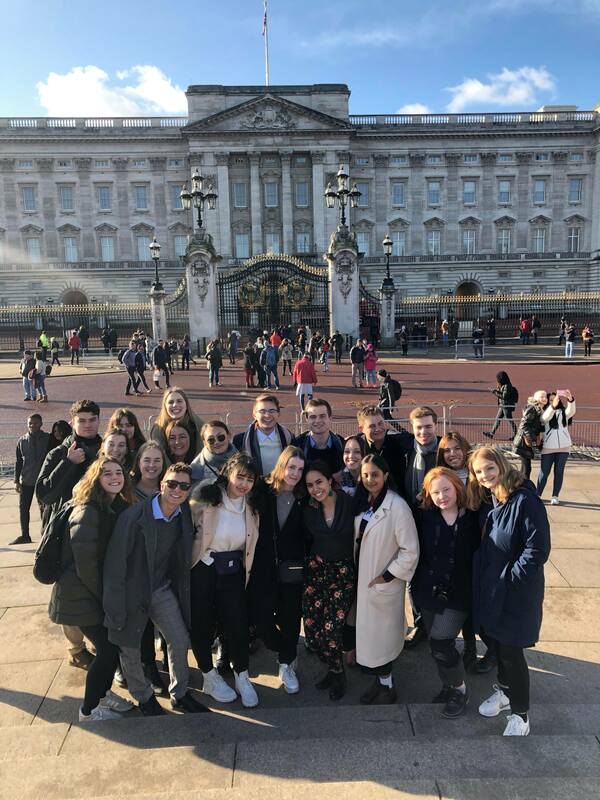 were heard expressing disbelief over the Palace’s relatively unassuming facade, it was still a fantastic experience to view the building, and the Victoria Memorial which stands opposite the Palace gates. We also learnt that the Queen was not in residence, as noted by the raised Union Jack, instead of the Royal Standard. After that, we walked our way to Westminster Abbey, Big Ben (though it was still unfortunately in the depths of construction! ), Trafalgar Square, and Piccadilly Circus. 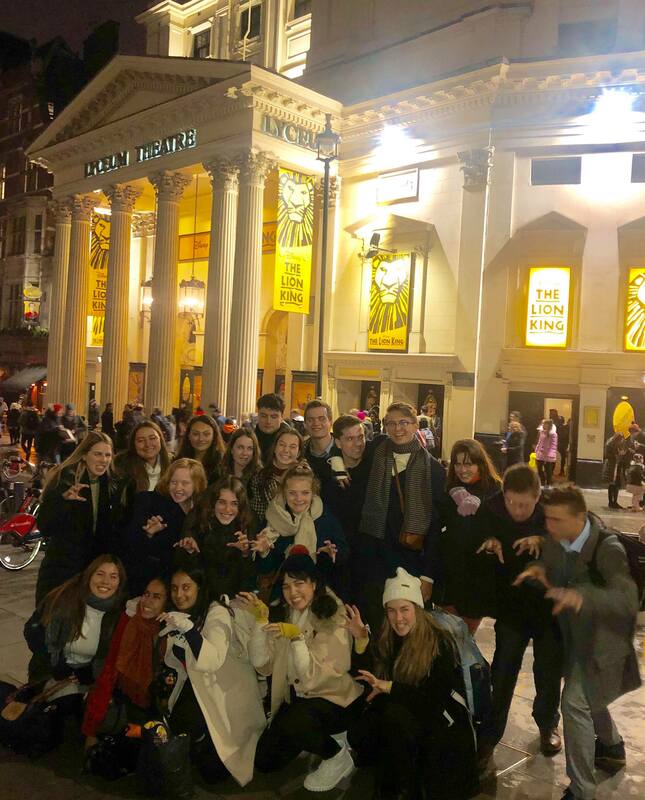 A lot of Delegates said that while the hustle and bustle of London remained the same as in New York, the former reminded them a lot more of home. An afternoon of shopping ensued, before the group came together in the evening for the Lion King musical at West End. The props were incredible, the costumes amazing, and it didn’t hurt to look at adult-Simba (who also happened to be a Kiwi!)! Stay tuned to catch the rest of our adventures in London and our first days in Paris! Posted in Global Development Tour, Global Development Tour 2019Leave a Comment on Goodbye, New York; Hello, London! It’s been a pretty busy two days for the Delegation. After a leisurely wake up call on Monday morning to make up for the flight delays (and the reaching of New York at midnight), we headed out to our first stop: the 9/11 Memorial Museum. The site included the empty blocks where the Twin Towers stood, which was a harrowing experience to say the least. Inside the Museum, you really got a picture of the sheer scale of the incident, the remnants from the buildings, and the various items that belonged to both victims and survivors was sobering, in the words of another Delegate. After a quick lunch, the Delegation ran to the Rockefeller Center to watch the sun go down from the top. Seeing New York’s buildings against the backdrop of pinks, oranges, and reds made for many a good ‘gram’, as the Delegates soon found. In fact, a certain someone was overheard saying, “this might even be in the 300s range” (when referring to potential likes). A hearty and delicious dinner followed at The Little Beet before the Delegation headed down to get their first glimpse of Times Square. 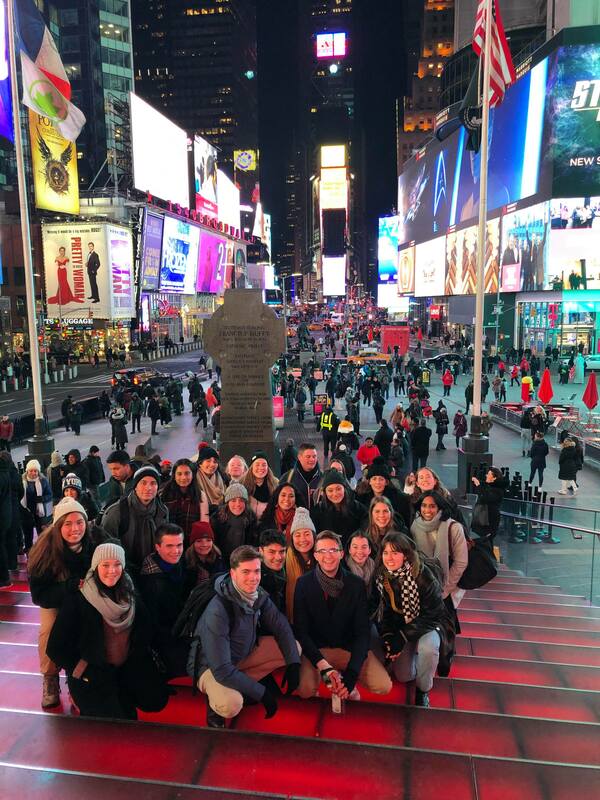 If there was any doubt in the Delegates’ minds that we weren’t in New York, it was quickly eradicated when surrounded by the lights, dressed up Statues of Liberty, and the iconic red steps. 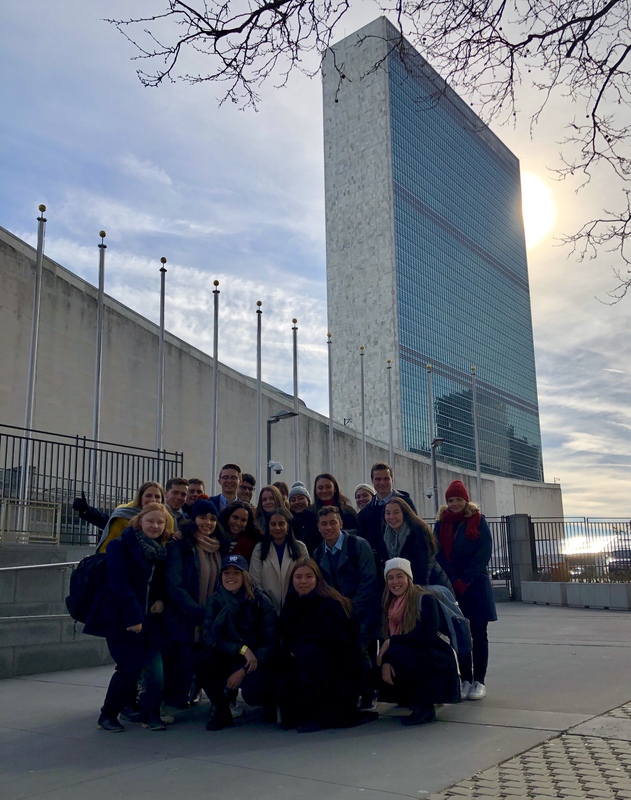 Day Two started off with a tour of the United Nations Headquarters – something that many Delegates looked forward to, since most of them foresaw jobs in diplomacy and international relations. The 45-minute tour included a history of the United Nations, an overview of the Universal Declaration of Human Rights and the Sustainable Development Goals, and the opportunity for Delegates to view the Security Council, the Economic and Social Council, and the General Assembly Halls. Though Chipotle was busy (and shelved for another day), the Delegates still had a great time eating in City Hall Park, where squirrels were aplenty. Surprisingly, the day wasn’t too cold; otherwise, crossing Brooklyn Bridge might not have been as easy as it was. 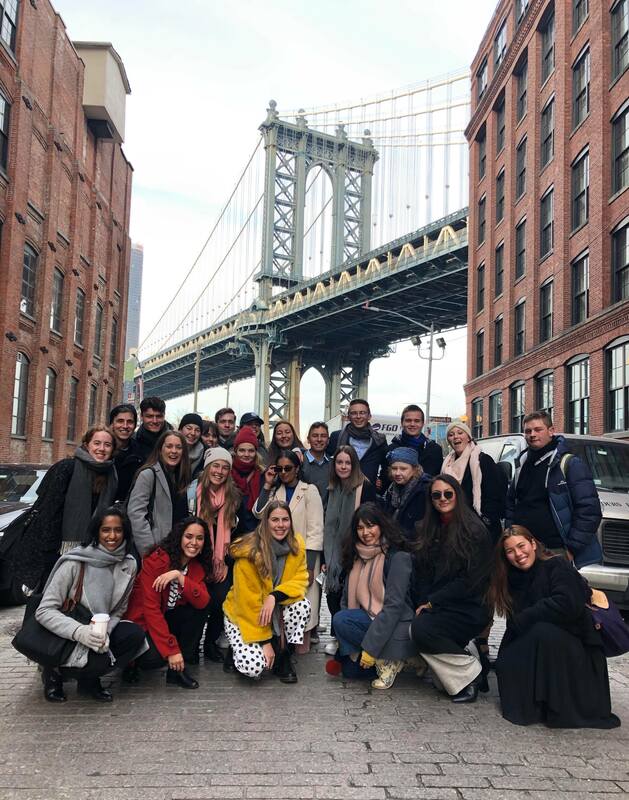 With a stunning view of the New York skyline behind the old sandstone from the Bridge itself, the walk was an experience enjoyed by both Delegates and Directors. 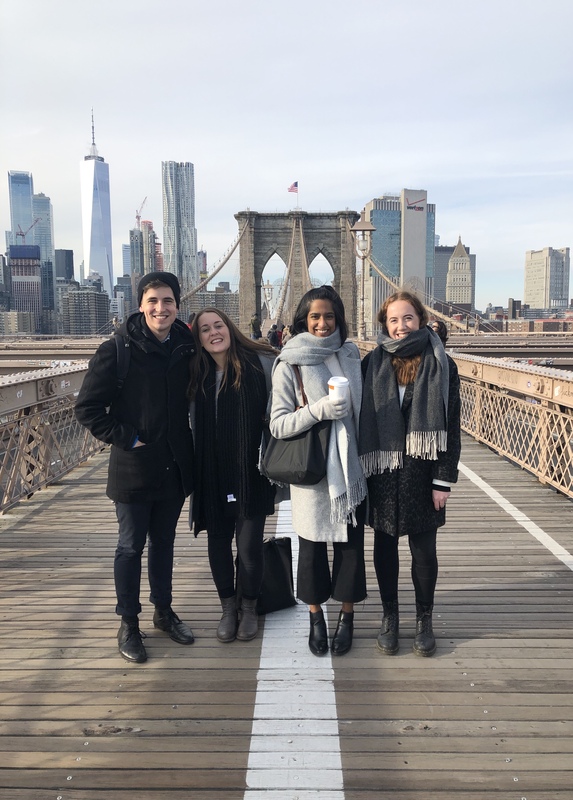 Since we didn’t have much time to spend in Brooklyn before dinner, the Delegation decided to stick around in the ‘DUMBO’ area (Down Under Manhattan Bridge Overpass). Doesn’t sound familiar? It’s the place where you can get amazing shots of the Manhattan Bridge, nestled perfectly between two picturesque red-brick buildings. After an entirely too-American dinner of pizza, burgers, and fries at Planet Hollywood, the Delegation split off into either Broadway or Ice Hockey for the evening. They went to a range of shows, including Hamilton, Chicago, The Book of Mormon, Pretty Woman, and Beautiful, and the Ice Hockey game was between the New York Rangers and South Carolina Hurricanes at Madison Square Gardens. Needless to say, it seems like everyone has cemented their plans to move to New York! Posted in Global Development Tour, Global Development Tour 2019Leave a Comment on Day Two & Three: New York, New York! Kia ora from Auckland Airport! After eight months of planning, studying, and general anticipation (not to mention an 11-hour delay! 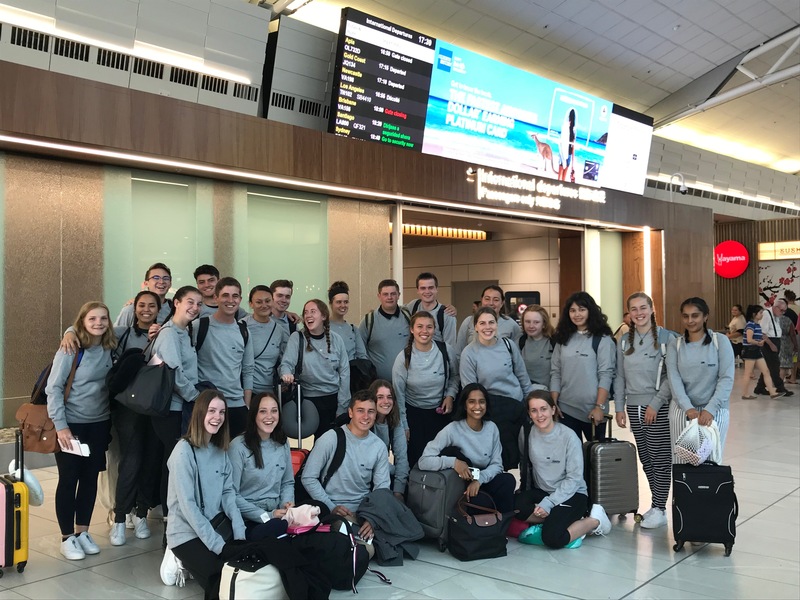 ), we’re finally all together and the Global Development Tour 2019 Delegation are ready to depart! It is going to be a hectic four weeks: after attending Columbia Model United Nations and Exposition in New York, the Delegation will meet with a range of diplomats, NGOs, and UN agencies who are involved with the Sustainable Development Goals – think Under-Secretary-General Jan Beagle in New York, Chatham House in London, and UNESCO in Paris (with many, many more!). If you’re keen to follow the progress of the Tour, check back here every few days for detailed updates of our travels through New York, London, Paris, Berlin, Vienna, Rome, and Hong Kong! Posted in Global Development Tour, Global Development Tour 2019Leave a Comment on And we’re off!